DCU’s fresher soccer team, led by Soccer Development Officer Fran Butler, defeated Mary Immaculate College 1-0 with an injury time winner in the Harding Plate final in the University of Limerick recently to win their second consecutive plate. A last-gasp winner from Jordan Noonan was enough to secure the university’s fourth plate after a hard-fought final with Mary I, who were competing in their first Harding competition. In a game that was hampered by the tough weather conditions, neither team could force a breakthrough until Noonan stepped up to the plate in the dying minutes. The weekend hadn’t got off to the perfect start for the Glasnevin university, as they were defeated 3-0 by an impressive NUI Maynooth in the quarter-final of the Harding Cup competition on the opening day. The Maynooth side looked strong from the opening minutes and a brace from Cillian Gallagher, supplemented by a long-range Mark Brennan effort, was enough to see them into the semi-finals, meaning DCU would advance to the plate competition. The semi-final of the plate competition would take place on the Saturday afternoon, with DCU coming up against University College Cork, who had been despatched 3-0 by NUI Galway in their cup quarter-final. A tight game was once again dominated by the weather conditions, most prominently the wind, which made it difficult for both teams. A drilled free-kick from John Reed opened the scoring for DCU early on in the game. However, the lead wasn’t to last long as Sean Feeney pulled UCC level just minutes later. The game was moving at a fast pace and it didn’t take long for DCU to regain the lead – one they would not relinquish again – when Colm Callinan struck to put the Dublin side 2-1 ahead. A stellar defensive display for the remainder of the game was enough to ensure DCU booked their place in Sunday’s final. Sunday dawned and it was an early start for DCU and Harding debutants Mary I as they took to the pitch at 10.30am to contest the plate final. Mary I had fought back from an opening day 7-1 humiliation at the hands of UCD to ensure they could go away from the tournament with their heads held high. 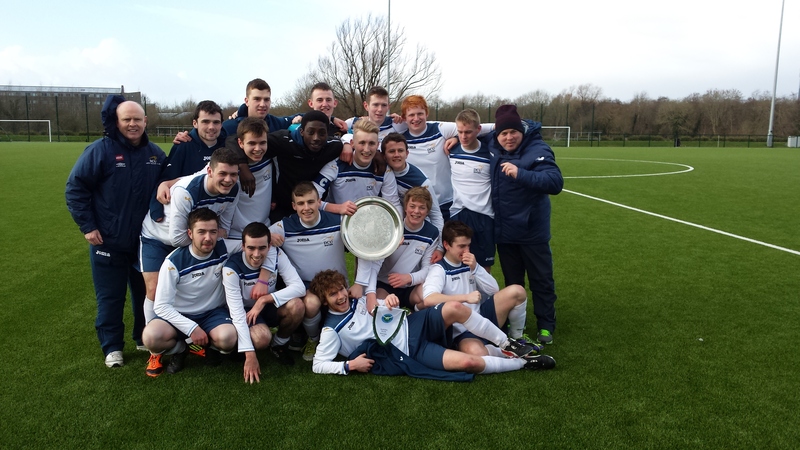 A narrow 2-1 victory over Trinity College on Saturday saw them through to the plate final to face DCU. The final was one of narrow margins with both teams contesting every ball wholeheartedly. With it looking as though extra-time may be on the cards, DCU’s Noonan popped up to send the silverware back up the M7 to the capital. With the Collingwood Cup looming at the end of the month for some of the fresher squad, Harding glory will provide a lot of confidence in the camp as they look to continue their success in Belfield.